Opening Reception and Gallery Walkthrough with Artist: Thursday, January 31, 2019, 5:30–7:30 p.m. The work of realist painter Laurin McCracken is influenced by the Dutch and Flemish still life painters of the 16th and 17th centuries. Before a serious commitment to the medium of watercolor in 2000, McCracken was a successful architect and a part-time photographer. He attended Auburn University and earned his Bachelor of Arts and Bachelor of Architecture from Rice University. He followed that with a Masters in Architecture and Urban Planning from Princeton University. His work as a practicing architect and as a photographer allowed him to travel extensively in Europe, the Middle East, and Japan. His photographs have been widely published in architectural journals, as book covers, and as book illustrations. Although McCracken did not take up watercolor until later in life, his existing skills in drawing, photography, and observation provided a strong foundation for his mastery of the medium. He studied with Gwenn Bragg at the Art League School in Alexandria, Virginia, and with Alain Gavin at the Art Institute of Chicago. He also carefully studied the works of still life masters who inspired his work. McCracken’s paintings have won many awards and have been exhibited in juried shows from coast to coast and internationally. Shows include those of the American Watercolor Society, the National Watercolor Society, the Transparent Watercolor Society, the Philadelphia Watercolor Society, the Niagara Frontier Watercolor Society, the Adirondacks National Exhibition of American Watercolors, and the Southern Watercolor Society. His paintings have also been included in many competitive international shows, including the Beijing International Art Biennale 2010, 2011, 2015, 2017; the Shenzhen International Watercolor Biennial 2012, 2014; the Thailand World Watermedia Exhibition 2014; and the Masters of Watercolour 2015, St. Petersburg, Russia. 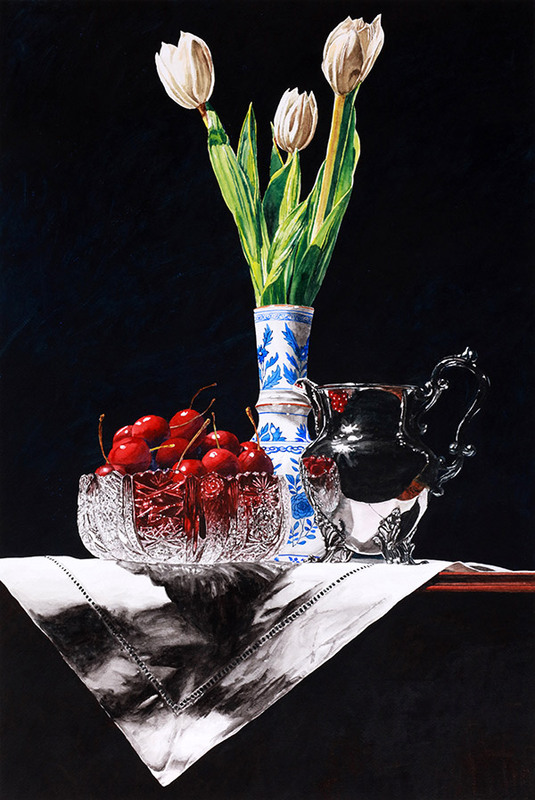 McCracken is the current president of the Watercolor USA Honor Society and the Country Leader for the USA for the Fabriano in Acquarello in Fabriano, Italy. He is a signature member of more than a dozen watercolor societies. A native of Meridian, Mississippi, McCracken currently resides and paints in Fort Worth, Texas. Read more about Visual Abundance: Realism in Watercolor here. Hear Our Latest News First! Feb. 1, Mar. 1, Apr. 5, and May 3. Check out the new Spring 2019 class schedule! Schedule a Museum tour and/or activity for your class that is customized for your grade level. Are you unable to make the trip to the Museum or just interested in an extra lesson to supplement your visit? Click here to learn about our free Traveling Trunk program.